Do Ты like the couple Drarry(Harry&Draco)? What do Ты think of "the old Draco" ? Выбор фанов: Aweful! Give me the young Draco back! If I made a Draco fanfic about a Остаться в живых sister from Harry Potter would anybody actually read it? Draco was on the upper landing, pleading with another masked Death Eater. Harry Stunned the Death Eater as they passed: Malfoy looked around, beaming, for his savior, and Ron punched him from under the cloak. Malfoy fell backward on вверх of the Death Eater, his mouth bleeding, utterly bemused. Draco had walked into the balcony room, to sit himself in a comfy, navy armchair, feeling himself sink into its cotton and feather mix, warming himself by the magical fire, which glowed brightly, filling the room with flickering light. Narcissa sat on the couch, comfortable, and relaxed, sipping on a bit of warm ButterBeer, and eating kippers and spiced rice. He stood there, on his stone balcony, staring down on the lawn with his icy gray eyes. It was cloudy, as if it were to rain soon. He would be gone to Hogwarts as a 3rd год student within a week. Draco Lucius Malfoy had a look of pure hatred on his eyes, jealousy laced in his eyes, mind, and heart. Anyway,yes I will go up to the point where they have Renesmee. And,I won't make it EXACTLY like the movie. 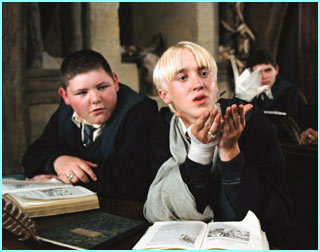 Draco will act еще flirtier and meaner than Edward ever was. a comment was made to the poll: Do Ты like the couple Drarry(Harry&Draco)?